I am away to Legoland with my 3 men ;) for two days and sceduled this post to go up on monday morning. I hope it works. Ich verbringe 2 Tage im Legoland mit meinen 3 Männern ;) und habe diesen Beitrag "vorprogrammiert. Ich hoffe es funktioniert. Pink and Brown is the challenge at the High Hopes blog this week, which has been set by the lovely and talented Tab from the High Hopes Design Divas. I used another of my new High HOpes images, illustrated by the wonderful Crissy Armstrong. Do you think this is why the stamp is called Crissy's snuggle bear? :) I gave this card to Isabella, my godchild, whose babtism was yesterday. Pink und Braun ist diese Woche die Herausforderung auf dem High Hopes blog, gestellt von der talentierten Tab aus dem High Hopes Design Team. Ich habe ein weiteres meiner neuen High Hopes Motive, illustriert von der fantastischen Crissy Armstrong, verwendet. Glaubt ihr der Stempel heißt deswegen Crissy's Kuschelbär? :) Ich habe diese Karte für Isabella, mein Taufkind, gemacht. Ihre Taufe war gestern. Thanks for your visit! I will be back with photos of our trip to Legoland tomorrow :) I hope we had good weather. Danke für euren Besuch! Ich werde euch morgen Fotos von unserem Besuch im Legoland zeigen :) Ich hoffe wir hatten gutes Wetter. An adorable card! I hope you;re enjoying Legoland! Well done on the belated post -0 it worked. The card is lovely, love the way you have done the flower. Hope you had a fab time in legoland. Das Mädel is ja süß! Und viel Spaß im Legoland! Das is sicher schön! Hope your trip is a great one! 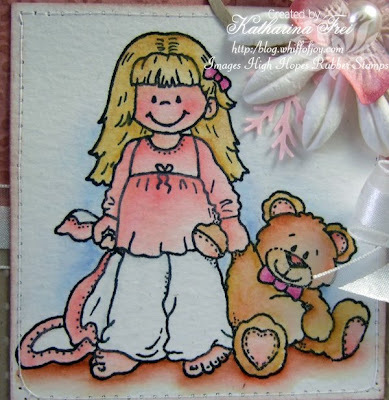 Gorgeous coloring, as usual, and I love the ribbon - you are an expert at using ribbon on a card! I should study and learn from you! Hugz!! This is really adorable!! Have fun at legoland!! Beautiful card Katharina! Sweet image!! What a beautiful card,l love the image and colours. Lovely image! I adore the little pearls on the swirl and the cute charm. Perfect layout. Ohhh the card is adorable!!! Hope you are having a great time in Legoland!!! fabulous card, so love this sweet image! Hope you are having fun at Legoland! OOh how lovely is this ,that image is so cute,Fab colouring too! Hope you,ve had a brill time. Beautiful card! I love the soft colors and your coloring of Crissy is awesome as well! I hope you had a great trip! cute card, hope you have fun in Legoland.. duh who am I kidding how coundn't one have fun i Legoland ? Can't wait to see your piccies as we are off to Legoland for a couple of days next week! Adorable, Katharina...& how jealous am I that you get to go to Legoland!!!! I wanna go toooooooo!! Beautiful card, Katharina! Great layout and an adorable image. Perfect colouring as always. I thought, since like crafts... you might enjoy this website, in order to store all your craft supplies and keep your stuff organized.